2017 Gartner Data & Analytics Summit: What Was Most Relevant? Wrapping up an exciting – and busy! – trip to Grapevine, Texas, for this year’s Gartner Data & Analytics Summit, I could only think how our product is making waves. We saw that reaction firsthand when we demonstrated AnswerRocket in Gartner’s Innovative BI in Action session on the first day. And for the next several days, we spoke with hundreds of business and analytics leaders who are striving to make their organizations even more data driven. From just a year ago, when I first attended the Summit, to this year, the BI and analytics space is moving at breakneck pace. Analytics vendors are rapidly enhancing their features and capabilities. At the same time, enterprise businesses are investing in new platforms and data processes at a faster pace than we’ve seen previously. It’s also exciting to see is the advancing integration of data into everyday business operations. Gartner spent much of the summit focusing on how businesses can transform into agile powerhouses by leveraging their data, particularly though the role of the Chief Data Officer. 1. Data has gravity – keep it where it is! During an organization’s foray into modern analytics, technical analysts inevitably take stock of the data they currently use and figure out how to get everyone governed access. Sound familiar to you? If you’ve jumped into or completed a transition to modern data organization and away from spreadsheets and fragmented files to a data warehouse, that exercise isn’t in vain. Moving your data to a centralized repository where business users can access data and share the same data definitions is critical to making decisions fast. The good news is that if you’re happy with your existing data warehouse solution, AnswerRocket can connect directly. You can keep your data in place. If you’re not ready to build your own data warehouse, we can help create one with you. Also heard at the Gartner Summit was an increasing reliance on machine learning algorithms and artificial intelligence to unearth valuable insights. During the Innovative BI in Action session, AnswerRocket presented a revolutionary move toward the next step of analytics, incorporating advanced search-based data discovery for descriptive analysis with auto-discovery analysis for prescriptive results. Behind the jargon, we combine advanced statistical analyses and a customized and unique understanding of your business to harness the power of advanced computing. You aim in the right direction, we target and fire, returning the most relevant results. We see a future where business users utilize the computation power at their fingertips to multiplex their searches broadly and deeply within their data. With natural language processing (NLP) and natural language generation (NLG) working together, we help users ask questions and understand answers, becoming the oft-used term, citizen data scientist. The crowd feedback to this presentation was especially gratifying. 61% of the attendees rated advanced search-based data discovery as high impact or transformational in the marketplace. And of the five presentations made, attendees rated our capabilities as tied for the most relevant to their business needs today. 3. Keep your data scientists focused on what’s important. Business users have the tools they need to access answers to many of their data questions, without the intervention of a BI analyst or data scientist. While it may seem contradictory, now is when data scientists are needed more than ever. With self-service analytics tools like AnswerRocket available to users today, the routine questions commonly answered by cut and paste SQL are now answered in seconds. This leaves the interesting and challenging business analytics to the data experts. And by the way, these data experts can use AnswerRocket, too. We’ve got some new ways of visualizing data, like Sankey diagrams and waterfall charts. Our augmented analytics known as insights are a great way for discovering trends that might not be immediately evident. Data experts and business users alike can take advantage of built-in machine learning algorithms to apply advanced analysis to their questions. 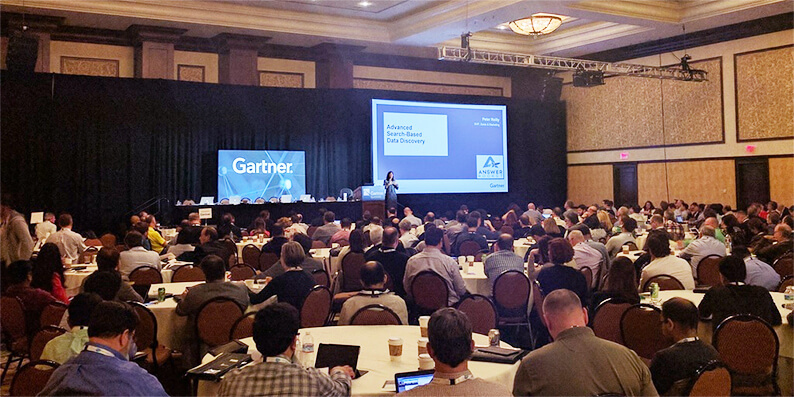 This year’s Gartner Data & Analytics Summit was an amazing opportunity to see the rapid changes occurring in the market. If you’re looking for more information from Gartner, check out their 2017 Cool Vendors in Analytics Report. If you weren’t able to attend and would like to see how AnswerRocket can help business users get quick answers to their questions, request a demo today.